Download "Mercy Health Training Institute TOID: 22085. 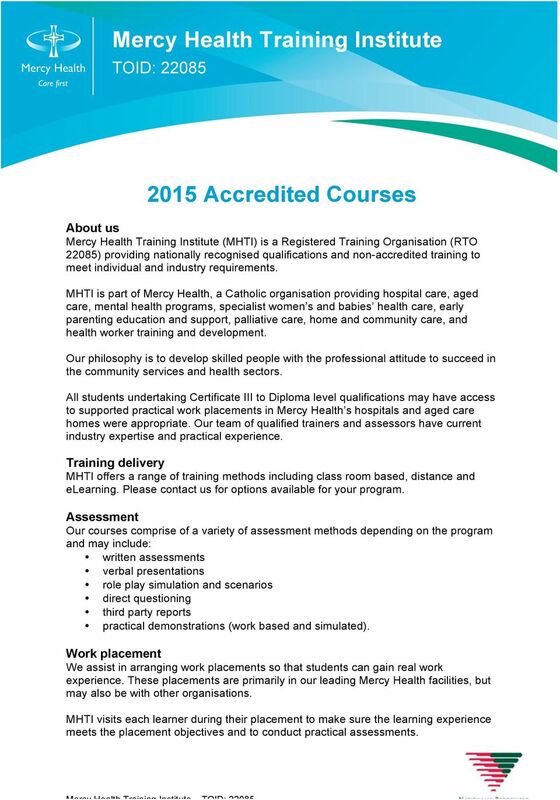 2015 Accredited Courses"
1 Mercy Health Training Institute TOID: Accredited Courses About us Mercy Health Training Institute (MHTI) is a Registered Training Organisation (RTO 22085) providing nationally recognised qualifications and non-accredited training to meet individual and industry requirements. MHTI is part of Mercy Health, a Catholic organisation providing hospital care, aged care, mental health programs, specialist women s and babies health care, early parenting education and support, palliative care, home and community care, and health worker training and development. Our philosophy is to develop skilled people with the professional attitude to succeed in the community services and health sectors. All students undertaking Certificate III to Diploma level qualifications may have access to supported practical work placements in Mercy Health s hospitals and aged care homes were appropriate. Our team of qualified trainers and assessors have current industry expertise and practical experience. Training delivery MHTI offers a range of training methods including class room based, distance and elearning. Please contact us for options available for your program. Assessment Our courses comprise of a variety of assessment methods depending on the program and may include: written assessments verbal presentations role play simulation and scenarios direct questioning third party reports practical demonstrations (work based and simulated). Work placement We assist in arranging work placements so that students can gain real work experience. These placements are primarily in our leading Mercy Health facilities, but may also be with other organisations. MHTI visits each learner during their placement to make sure the learning experience meets the placement objectives and to conduct practical assessments. 2 Resources and support services We provide a range of support services and resources to assist students complete their training. These include: student handbooks work placement handbooks computer access experienced trainers and assessors. 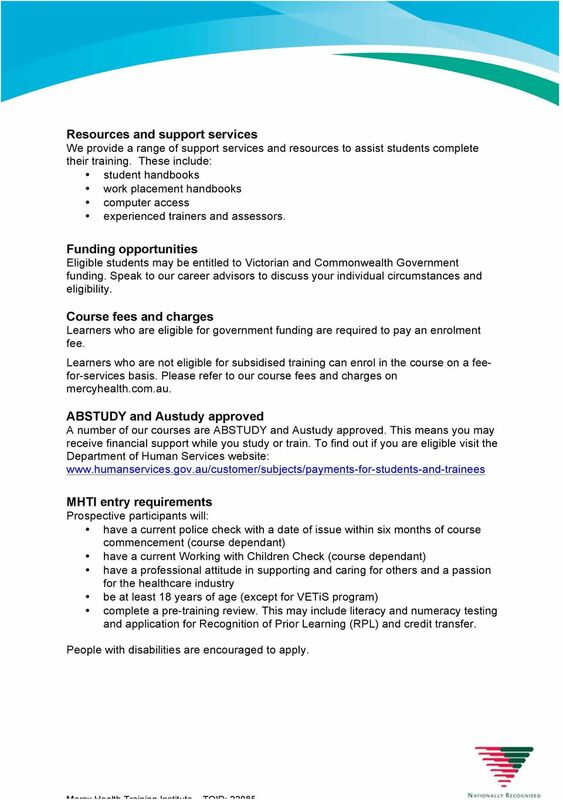 Funding opportunities Eligible students may be entitled to Victorian and Commonwealth Government funding. Speak to our career advisors to discuss your individual circumstances and eligibility. Course fees and charges Learners who are eligible for government funding are required to pay an enrolment fee. Learners who are not eligible for subsidised training can enrol in the course on a feefor-services basis. 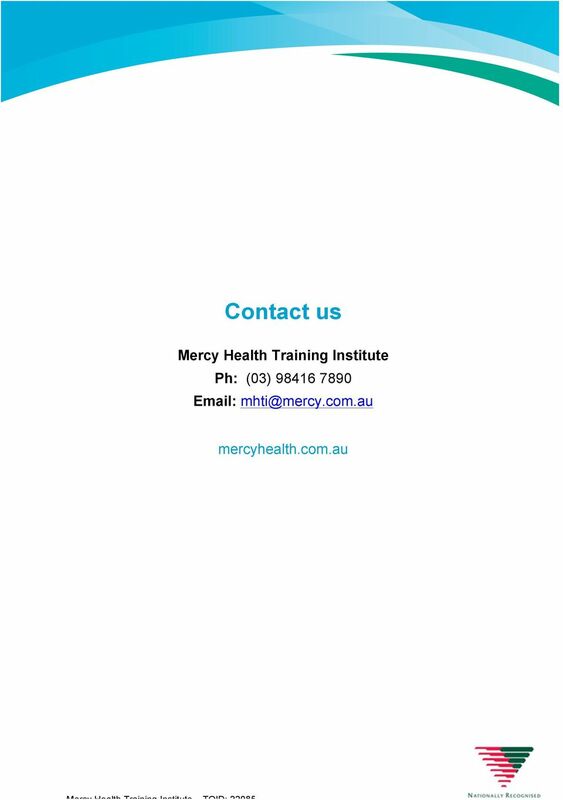 Please refer to our course fees and charges on mercyhealth.com.au. ABSTUDY and Austudy approved A number of our courses are ABSTUDY and Austudy approved. This means you may receive financial support while you study or train. To find out if you are eligible visit the Department of Human Services website: MHTI entry requirements Prospective participants will: have a current police check with a date of issue within six months of course commencement (course dependant) have a current Working with Children Check (course dependant) have a professional attitude in supporting and caring for others and a passion for the healthcare industry be at least 18 years of age (except for VETiS program) complete a pre-training review. This may include literacy and numeracy testing and application for Recognition of Prior Learning (RPL) and credit transfer. People with disabilities are encouraged to apply. 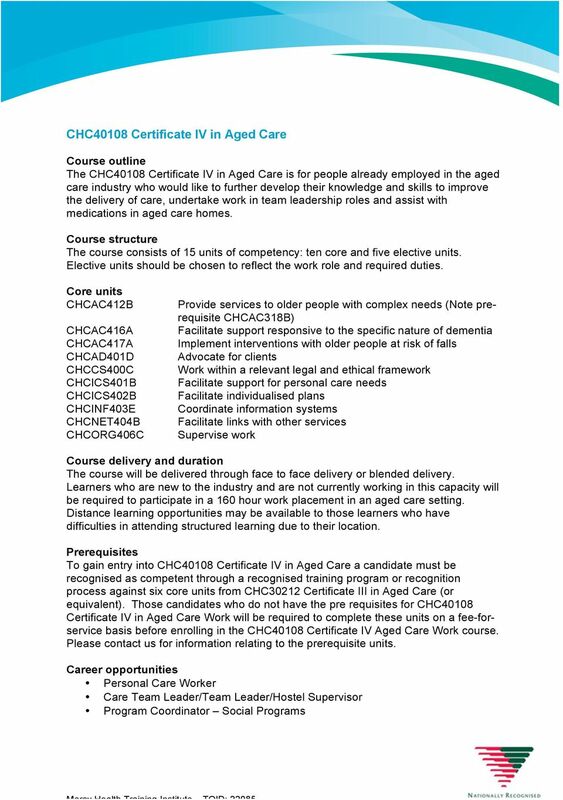 3 CHC30212 Certificate III in Aged Care Aged care workers are primarily responsible for providing individualised personal care to older people in aged care homes in order to maintain resident independence and support their quality of living. Aged care workers may assist with personal care duties such as showering, dressing, feeding, toileting, transport, transfer and general mobility and emotional support. They may also assist with physical care such as checking blood pressure, urinalysis, temperature, pulse, weight and blood glucose monitoring. The course consists of 14 units of competency: ten core units and four elective units. Elective units will be chosen to reflect the work role and required duties. Core units CHCAC317A CHCAC318B CHCAC319A CHCCS411C CHCICS301B CHCICS302B CHCICS303A CHCWHS312A CHCPA301B HLTAP301B Support older people to maintain their independence Work effectively with older people Provide support to people living with dementia Work effectively in the community sector Provide support to meet personal care needs Participate in the implementation of individualised plans Support individual health and emotional well being Follow WHS safety procedures for direct care work Deliver care services using a palliative approach Recognise healthy body systems in a health care context The course will be delivered through face to face delivery or blended delivery. Learners who are new to the industry and are not currently working in this capacity will be required to participate in a 160 hour work placement in an aged care setting. Distance learning opportunities may be available to those learners who have difficulties in attending structured learning due to their location. 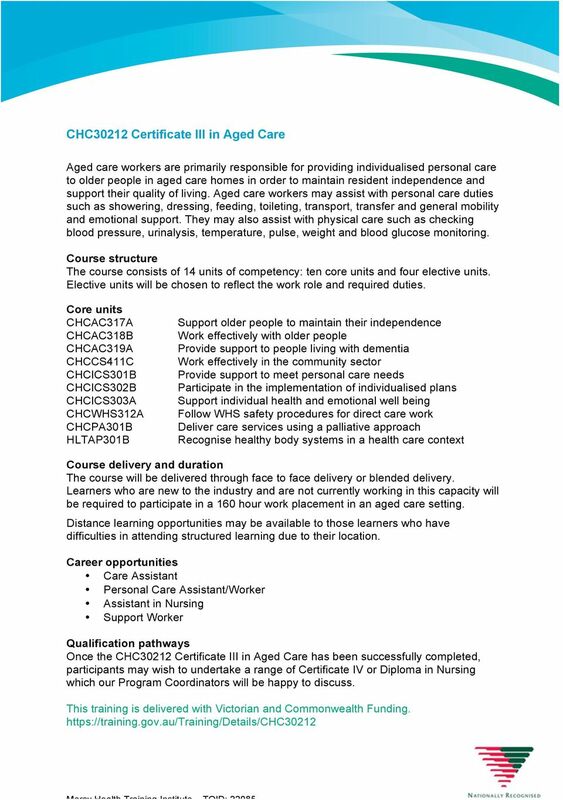 Career opportunities Care Assistant Personal Care Assistant/Worker Assistant in Nursing Support Worker Qualification pathways Once the CHC30212 Certificate III in Aged Care has been successfully completed, participants may wish to undertake a range of Certificate IV or Diploma in Nursing which our Program Coordinators will be happy to discuss. 5 Qualification pathways Once the CHC40108 Certificate IV in Aged Care has been successfully completed, students may wish to undertake a range of diploma or higher level qualifications which our Program Coordinators will be happy to discuss with you. 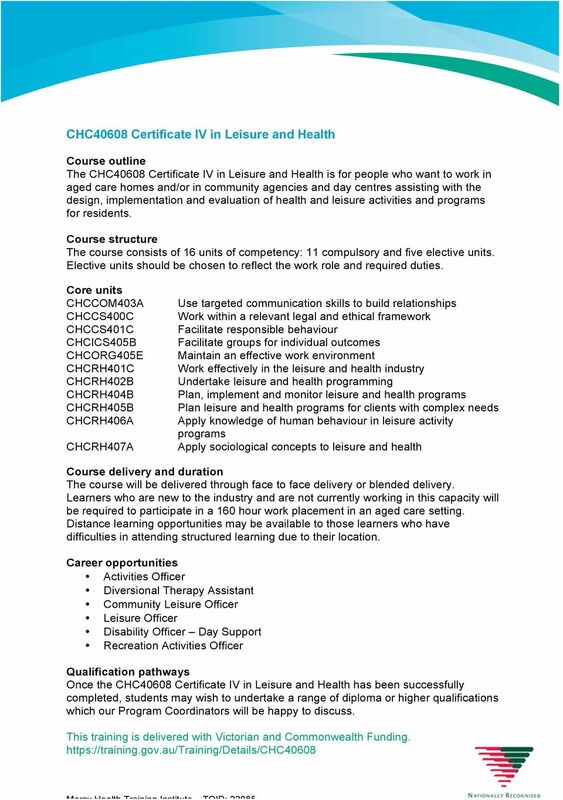 6 CHC40608 Certificate IV in Leisure and Health Course outline The CHC40608 Certificate IV in Leisure and Health is for people who want to work in aged care homes and/or in community agencies and day centres assisting with the design, implementation and evaluation of health and leisure activities and programs for residents. The course consists of 16 units of competency: 11 compulsory and five elective units. Elective units should be chosen to reflect the work role and required duties. Core units CHCCOM403A CHCCS400C CHCCS401C CHCICS405B CHCORG405E CHCRH401C CHCRH402B CHCRH404B CHCRH405B CHCRH406A CHCRH407A Use targeted communication skills to build relationships Work within a relevant legal and ethical framework Facilitate responsible behaviour Facilitate groups for individual outcomes Maintain an effective work environment Work effectively in the leisure and health industry Undertake leisure and health programming Plan, implement and monitor leisure and health programs Plan leisure and health programs for clients with complex needs Apply knowledge of human behaviour in leisure activity programs Apply sociological concepts to leisure and health The course will be delivered through face to face delivery or blended delivery. Learners who are new to the industry and are not currently working in this capacity will be required to participate in a 160 hour work placement in an aged care setting. Distance learning opportunities may be available to those learners who have difficulties in attending structured learning due to their location. Career opportunities Activities Officer Diversional Therapy Assistant Community Leisure Officer Leisure Officer Disability Officer Day Support Recreation Activities Officer Qualification pathways Once the CHC40608 Certificate IV in Leisure and Health has been successfully completed, students may wish to undertake a range of diploma or higher qualifications which our Program Coordinators will be happy to discuss. 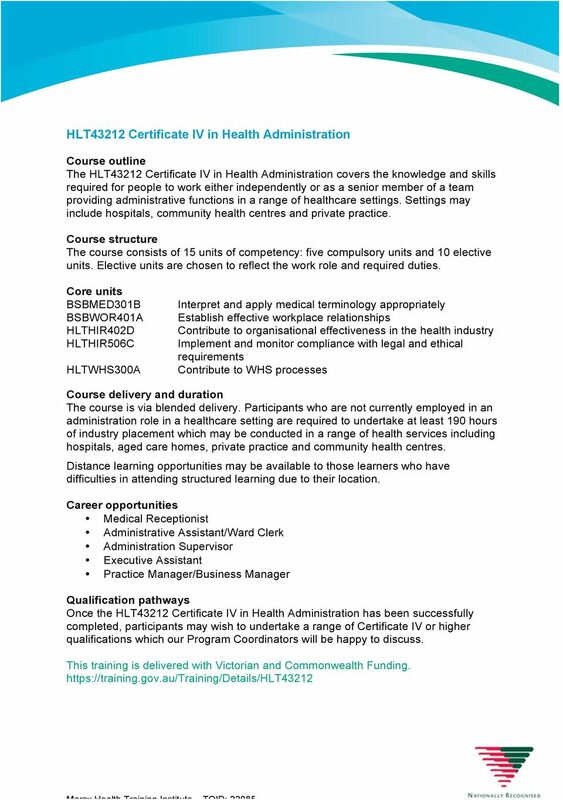 7 HLT43212 Certificate IV in Health Administration Course outline The HLT43212 Certificate IV in Health Administration covers the knowledge and skills required for people to work either independently or as a senior member of a team providing administrative functions in a range of healthcare settings. Settings may include hospitals, community health centres and private practice. The course consists of 15 units of competency: five compulsory units and 10 elective units. Elective units are chosen to reflect the work role and required duties. Core units BSBMED301B BSBWOR401A HLTHIR402D HLTHIR506C HLTWHS300A Interpret and apply medical terminology appropriately Establish effective workplace relationships Contribute to organisational effectiveness in the health industry Implement and monitor compliance with legal and ethical requirements Contribute to WHS processes The course is via blended delivery. Participants who are not currently employed in an administration role in a healthcare setting are required to undertake at least 190 hours of industry placement which may be conducted in a range of health services including hospitals, aged care homes, private practice and community health centres. Distance learning opportunities may be available to those learners who have difficulties in attending structured learning due to their location. Career opportunities Medical Receptionist Administrative Assistant/Ward Clerk Administration Supervisor Executive Assistant Practice Manager/Business Manager Qualification pathways Once the HLT43212 Certificate IV in Health Administration has been successfully completed, participants may wish to undertake a range of Certificate IV or higher qualifications which our Program Coordinators will be happy to discuss. 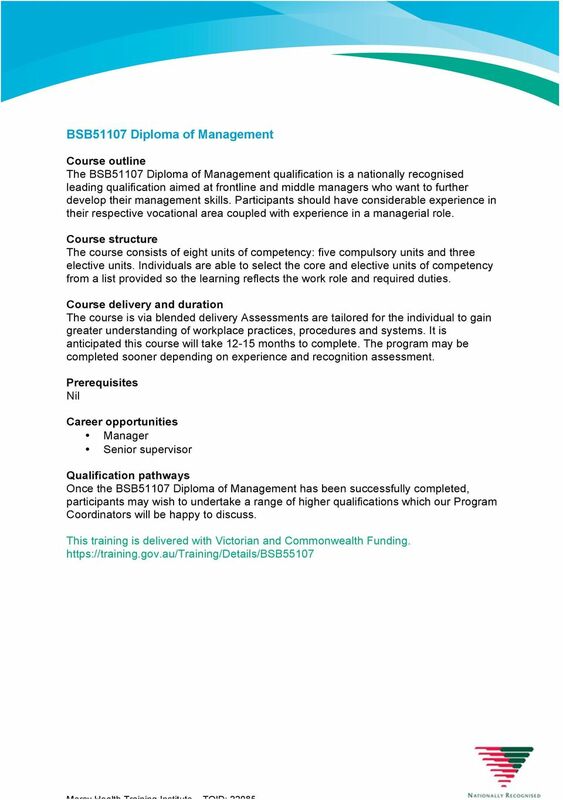 8 BSB51107 Diploma of Management Course outline The BSB51107 Diploma of Management qualification is a nationally recognised leading qualification aimed at frontline and middle managers who want to further develop their management skills. Participants should have considerable experience in their respective vocational area coupled with experience in a managerial role. The course consists of eight units of competency: five compulsory units and three elective units. Individuals are able to select the core and elective units of competency from a list provided so the learning reflects the work role and required duties. The course is via blended delivery Assessments are tailored for the individual to gain greater understanding of workplace practices, procedures and systems. It is anticipated this course will take months to complete. The program may be completed sooner depending on experience and recognition assessment. Prerequisites Nil Career opportunities Manager Senior supervisor Qualification pathways Once the BSB51107 Diploma of Management has been successfully completed, participants may wish to undertake a range of higher qualifications which our Program Coordinators will be happy to discuss. 10 VET in Schools (VETiS) Program outline The Vocational Education and Training in Schools (VETiS) program aims to prepare students for further education, training and employment. 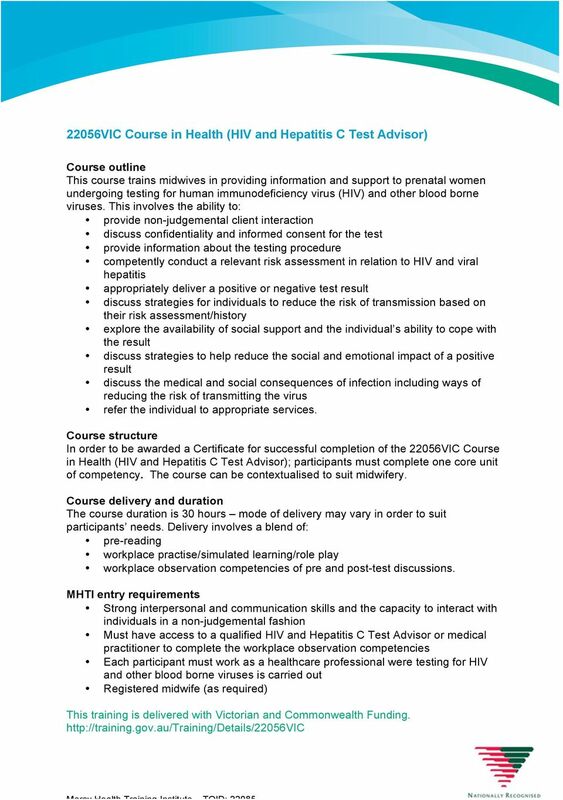 The benefits of undertaking this program include: a nationally recognised qualification upon successful completion of the program - HlT32412 Certificate III in Allied Health Assistance credits towards further VET qualifications potential to gain credit towards the VCE ATAR score hands on experience through structured workplace learning and placements (minimum of 80 hours placement over two (2) years). Eligibility and enrolment VETiS programs are available to senior secondary school students (Year 10 and 11) students who are older than 14 years and 10 months of aged at the time of enrolment while completing their VCE. The VET course is undertaken as part of the students VCE or VCAL programs. 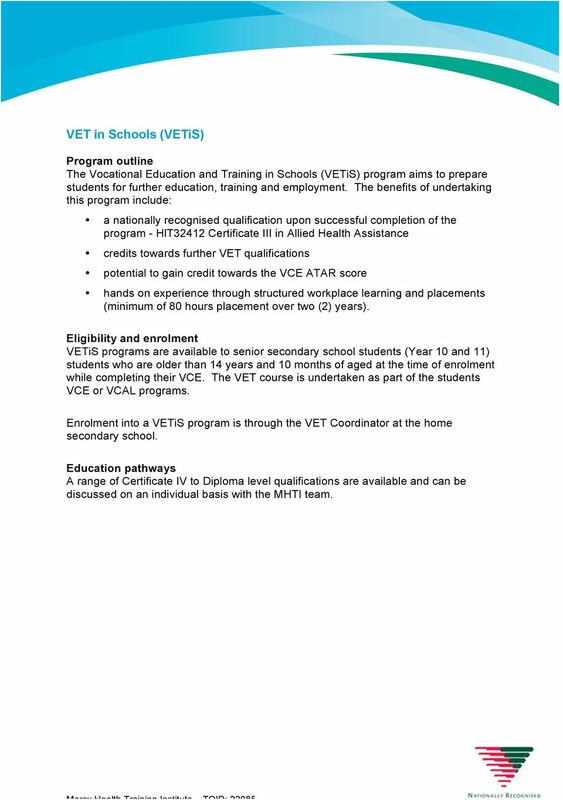 Enrolment into a VETiS program is through the VET Coordinator at the home secondary school. Education pathways A range of Certificate IV to Diploma level qualifications are available and can be discussed on an individual basis with the MHTI team.